Adequate emotional support during formative years is essential for lifelong success. This story changed my life and so I would like to share it. My hope is that it may inspire you now or in the future to seek out a great challenge or goal and to know in advance that you can achieve that goal, if you want it enough. Jim Valvano was a great mind and basketball coach. By many accounts, he was an even better person. His story is one of collegiate basketball lore. For those who are unfamiliar, his messages of motivation and inspiration were simple in diction but deep in their message. Valvano’s story is one of humble beginnings. He grew to be a good student and athlete. Upon graduation from college, he earned an opportunity as college basketball coach. 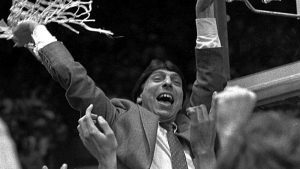 It was during this time that Valvano developed dreams of winning a national championship. You may know, each year, the NCAA hosts a tournament to determine the champion. Valvano had a clear goal in mind. He used visualization to aid in achieving his goals. Throughout his journey, he communicated his message to himself using self-talk, to his players, and to everyone involved in his life. He built a tremendous support network and involved other people in his dream. He worked tirelessly to improve and motivate himself. His professional life as a coach led him to a tremendous opportunity as the head coach at North Carolina State University. The gift was that his father believed in him. Valvano’s father asked him what his aspirations were.Valvano said, “I want to win a national championship. It’s very difficult to do.” Valvano’s father not only assured him that he would win, but also that he would be there to see it happen. Not long after their conversation, on another visit to his parent’s home, Valvano’s father brought him tohis room. In his father’s bedroom were suitcases. Already packed with clothes for a trip. His father believed in him so much, that he was ready in advance to make his trip to watch his son win the national championship. His father said, “You’re going to win, you’re going to make it, I know you are, my bags are packed for you.” Valvano was so moved. He knew then that nothing would stop him. Only a few years later, in 1984, the North Carolina State Wolfpack men’s basketball team reached the championship game. Against great odds, the team won in dramatic fashion on a last second shot. Dreams can come true. Valvano was inspirational to everyone he met. Like Valvano and his father, I encourage everyone this semester to believe in someone. Believe in yourself and as important, believe in a friend or family member and let them know that you do. Also, let them know why. We all have buried emotions and dreams.